Are the growing doubts justified? Most Americans still favor the death penalty, but support has declined in the past five years. Critics point to documented attacks on the reliability and fairness of court procedures in capital cases. 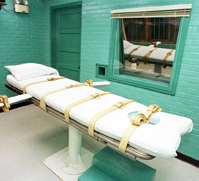 They claim too many death sentences are reversed on appeal and that flaws in the system, including inadequate defense counsels, create an unacceptable risk of executing an innocent person. Supporters of capital punishment say legal safeguards are adequate and that no innocent person has been put to death in recent years. The changing climate can be seen in the enactment of state laws to limit the death penalty and in cases before the Supreme Court, which is set to decide whether it is unconstitutional to execute mentally retarded offenders.